I would love to visit your house! I think you have a bigger selection of reptiles then any of the local shops around here. Nice addetion to the family.. He/she is beautiful! By the way... Do you have any babys (eggs) for the Iguana yet? sadly my brother moved out yesterday morning :'( had a blowup with mom and dad took all his animals with him. 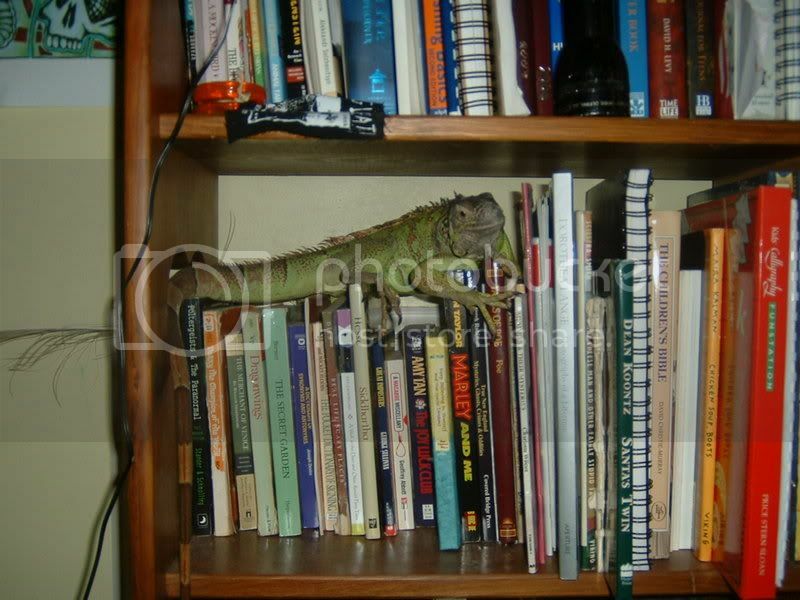 no more geckos, no more layla, no charlie lackey... its just my snake, my iguana, and his fish left. its actually a lot sadder than i expected it to be. so empty and now his room is freezing. i'll try to get him to send me a picture of the new snake. nah she hasnt dropped them yet, im getting antsyy and the vet has been on vacation for the past week. i just want them to take them out and be done with it so she can start feeling better. HEHEHE!!! You come up with some of the coolest pictures!! Anyway that ****s about your brother moving out, but hey... You have alot more space to expand your collection again!! thanx i get a little camera happy at times. i have a picture that i want to use as an avatar but i cant shrink it down to size without it looking like crap. any suggestions? By that photo does anyone have an estimate on Donnie's age? No probs Magic...photobucket can be a bit fussy on codes sometimes. Rather than clicking on the code itself click on the button next to the code and it copies everything the way it wants it. Is that the little snake in the hand on the previous page? He still looks like a hatchling to me (cute little snake though). My Pythons were that size when they were about 2 or 3 months old, but my snakes have a different growth rate than yours I think. :? Surely he don't live to far away if he can come back to pick up a aquarium. Sounds like once he gets settled in you will be able to visit him.